I have some special polishes to share with you today. étoile polish is infused with diamond dust! 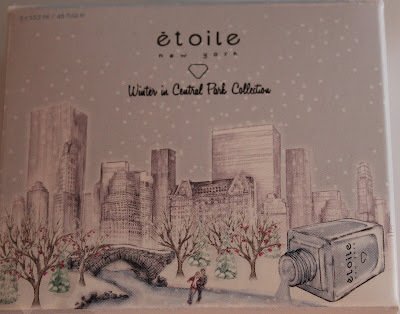 étoile founder, Erin Farber, created a polish line that would be fitting for a momentous occasion like a wedding. She decided to take chic polish colors and infuse them with genuine diamond dust – the perfect complement to the diamond ring. And so étoile was born! I received the Winter in Central Park Collection and I must say the colors are amazing. Diamonds are definitely a girl's best friend - including in nail polish. The diamond dust creates an amazing shimmer and shine that adds depth to the polish. The formula was wonderful. It applied smoothly and the dry time was relatively quick. The collection came in this adorable box. I love how the polish bottle is tipped over and is creating the lake. 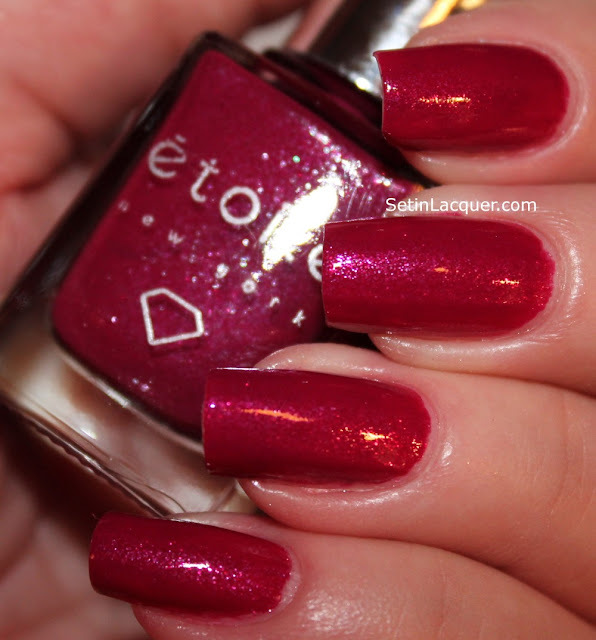 Frosted Berry - is a deep red berry shade, with a hint of pink, and is infused with real diamond dust. I had to photograph it next to my orchid which started to bloom last week. A splash of color for those winter days. This is two coats. Asscher - is a glorious winter white shade with tons of shimmer and shine. It's named for the Asscher-shaped diamond. It is a classic shade with a modern shimmer and shine. I used three coats for this shade. Reservoir - is a gorgeous periwinkle blue gray shade with a wonderful icy shimmer. This is two coats. I love this classy color! étoile's special patented formula is long wearing and free from the big three harmful ingredients: formaldehyde, toluene, and dibutyl phthalate (DBP). It’s also made in the USA – created in New York. étoile can be purchased on their website for $18. Make sure to follow them on Facebook to get updates on the newest collections.